I used to try to do posting all together, but I’ve changed my mind. I realized that it might be better to post one by one to finish fast. I’ll do my best to give tips as much as I can before sometime I quit my job. I’ve been in love with compact foundation. I can’t allow myself late for work because of makeup. Compact foundation doesn’t need taking some on wrist. Most have mirrors so it’s unnecessary to look for a mirror. It’s possible to apply in a car or taxi, even when walking streets. It hides blemishes so you can look formal only with this. Is compact foundation thick? That’s an old-fashioned story. Much of them are lighter than BB cream. Every product has its own feature. If you care a bit more, you can find one that catches your fancy. There’s no younger brother that is better than the older one. it’s very moist and it makes skin soft and has a powdery finishing feeling. The best point of this is that it is natural and light without stuffed feeling. It has a clear likes and dislikes of people. The color is the reason I didn’t feel like to use it. I became more satisfied as time goes. I noticed that the color makes natural expression. Applying darker one than your skin covers little blemishes, without concealer. So it is preferred for male entertainers with acne or blemishes who don’t have to be look that bright. 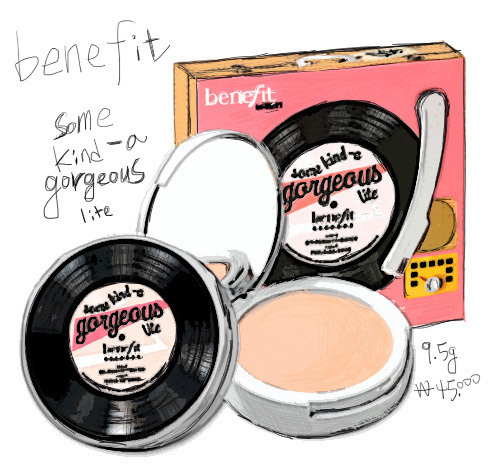 So, it’s what Benefit Some Kind-a Gorgeous Medium is about. It seems to be to catch customers with bright skin. As the color got bright, it doesn’t cover the blemishes that original one covered. So how can you call it a foundation? My friend was excited to buy it when it was newly released. “I meant it’s bad.” She got upset that she saw only good talk about it on internet. Benefit said it’s an oil-free that expresses transparent face. I think it’s transparent itself rather than it gives transparent look. I felt like I wore nothing. I feel like apply only sunscreen. Even more, colored sunscreen covers better than this one. The sustainability is not good, either. I don’t get the point of naming ‘brand new product’ with only adding color. There’s no need to worry about breaking down as it’s cream typed compact. But that a mirror break into the product when dropped is not improved. Recently released foundations… have at least SPF. It’s mystery how it was released. Gorgeous Original... I’ve been using it very well. As a product for shading, not foundation, with a foundation brush! I use this instead of powdered shading when I express a moist skin. But… I tell you not to buy ‘Lite’. If you say you have a perfect skin and you don’t need any covering, colored sunscreen would be better than this. It covers better, easier to add or fix, and most of all, it protects you from UV. In fact, it’s hard to say its light feeling is attractive considering I should add sunscreen on Gorgeous. Well, someone might feel attracted by its light finishing touch. If you want this feeling regardless of the price, Kevynaucoin or Giorgio Armani can be alternatives. My Me-Today came into Magazine Papa. But My Boss bought an I-phone 4…and he imposed me to use I-phone. He offered me to buy me an I-phone 4,so I’m waiting for it to be released. So I concluded. “I will send a picture through Me-Today only after I get a new phone”. But,I thought it might be great to upload postings on Me-Today, so I moved to a blog. So I’m informing you of this. Someday, I may meet you off line using Me-Today.